Much of Davin’s working life has revolved around the teaching and coaching of swimming and water safety. Alongside that he also brings extensive management and local government experience to the organisation, having owned and operated a large swim school and managed New Zealand’s largest learn to swim business at Auckland Council. Davin has competed internationally in swimming, has been involved with Surf Lifesaving at Piha Beach for the past 35 years, from nipper to senior lifeguard and New Zealand surf lifesaving title holder. Davin is married with three daughters and in his spare time likes to remain active, including swimming and surfing. James has spent much of his life in, on and around the water. He is a keen surfer and has been involved with Surf Life Saving for the last 18 years with his home surf club at Bethells Beach. James brings extensive knowledge and experience around risk management, rescue techniques, emergency care training and education. This has developed over time for James working for First Training as their Training Manager, NZ Lifeguards and Lifeguard and Safety as film set safety, Surf Life Saving as their Regional Lifeguard Supervisor and Cardrona Alpine Resorts as their Snowboard Trainer and examiner. James is highly motivated to reduce drowning through education and looks forward to working with your school, workplace or community group soon. Teresa is both an aquatic practitioner and a participant having been a NZ Swimming representative and NZ Surf titleholder. She is a qualified swim teacher and has held positions with Surf Life Saving New Zealand and Sport North Harbour. Together with Dr Kevin Moran, Teresa has had research published in Injury Control and Safety Promotion journal in September and December 2006. Teresa is an active swimmer, surfer, scuba diver and cyclist. Teresa brings her extensive experience and expertise in a number of aquatic areas specifically in relation to Injury Prevention and Early Childhood. My passion for aquatic education comes from a childhood spent having fun in the South Island rivers, lakes and at East Coast beaches. Over the years my career in education has included teaching in primary schools and at tertiary level as a lecturer in physical education and teaching practice, and as an adviser in schools providing professional learning for teachers and school leaders. In my current role as an Aquatic Educator I am committed to providing the best possible support to teachers and schools to enable our children and their whānau to enjoy, and stay safe in New Zealand’s unique aquatic environment. Samantha has been in water for most of her life; by being a competitive swimmer and surf lifesaver. She also has taught and coached swimming for nearly 15 years and been the brand manager for the Arena swimming brand for over 9 years. She holds a Bachelor of Sport and Recreation degree where she majored in business and management. 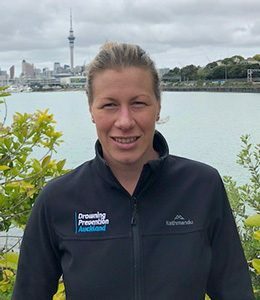 Sam is the Business Manager at DPA and looks forward continuing her learning and growing at Drowning Prevention Auckland. Prior to joining the team Harry was working as a Tutorial Assistant and gym instructor at Unitec New Zealand and has a strong background in rugby league. He has played for the Auckland Premier and NZ Universities Rugby League Teams, the Auckland Vulcans (Warriors Reserve Grade), Mt Albert Lions and professionally for Limoux in France. Harry’s background, skills and experience are invaluable with his focus on youth, Māori and Pacific communities. Te Hikutu te Hapu and Nga Puhi te Iwi. Clayton has more than 14 years experience in public health delivering community development projects that successfully improve health and wellbeing outcomes for Maori in both urban and rural settings. He has held a variety of roles from drug education, reducing alcohol-related harm to smokefree and National Maori Health Promoting Schools facilitator. Clayton is an accomplished waka ama paddler and open-water diver, through which he has demonstrated a long-standing passion for water safety, providing advocacy and education within his community to address, in particular, unsafe practice in the area of collecting kai moana. Clayton’s strength is his ability to engage with hard-to-reach Maori communities, leading change that is both empowering and sustainable. Kushida Started WaterSafe Auckland as a volunteer 4 years ago as a Admin Support. She is a graduate of the University of the South Pacific, Fiji, where she majored in Business Management and Economics. She also has a Certificate in Computing and Administration from Unitec, Auckland. Kushida is a Fijian Muslim [she speaks Hindi and Fijian], Kushida is married and has 2 young kids and in her spare time She loves spending time with her family. 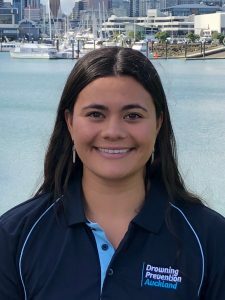 Leilani is business graduate from AUT who completed her co-operative education at Drowning Prevention Auckland in her last year of university. Leilani is a volunteer surf lifeguard at United North Piha and has been involved in surf lifesaving for 10 years competing in surf sports. She also participates in surf boats for the Orewa Diamonds. Leilani enjoys travelling and experiencing different cultures. She is the New Settler Aquatic Educator who run holiday programmes and helps with events and promotions.